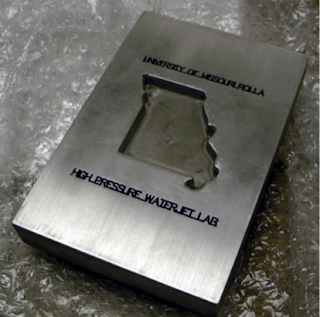 As abrasive waterjets have developed they have been used to both cut through materials, and, in more recent work, have been used to mill pockets within the internal part of the piece. In the early parts of pocket milling simple linear cuts were made adjacent to one another across the space where the pocket needed to be created. However, with the need to slow the head down and reverse direction, the edges of the pocket were being cut deeper than the inside floor, and this could cause some problems with part life and utility. The first step to overcome this problem was to provide a mask, cut to the size of the pocket to be cut, but made out of a harder material, such as steel. By placing the mask over the piece, and setting the machine so that the cuts were made at constant speed over the pocket, a flat floor could be cut. All the slowing and reversing of the head takes place over the mask, so that it is destroyed fairly quickly. But if it survives one milling, then for some parts this provides a process that cannot be achieved in other ways. Consider, for example, the sheet of glass cut in figure 1. The corners of the pockets are relatively sharp and of consistent radius all the way down the wall, which is relatively straight. A conventional mechanical milling tool transmits high levels of force between the part being milled and tool holder. Therefore, to prevent vibrations, the tool diameter must be no less than a quarter of the tool length. This means that the radius of the pocket wall cannot be less than one-eighth of the pocket depth. That restriction does not exist with an abrasive waterjet milled pocket, where the radius can be much tighter. 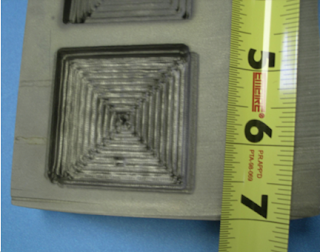 This is a critical issue in the milling of parts, where the milling is to get weight out of the component. In many parts that are made for the aircraft industry the part can be designed so that much of the internal volume is not needed for strength, and can be removed to lower the weight. But with conventional tools there are limits to how much can come from a single pocket, not with the AWJ system. 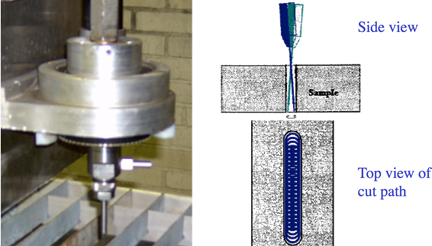 As the above figure shows, and masking and other techniques allow, the radius of the corner can fall below a tenth of an inch even when milling pockets more than eight-inches deep. There remain, however, a number of problems with the use of the masking technique. It takes time to make and install the mask, and it costs an additional expense that makes the process less competitive. One of the problems that arise with the use of masking comes with rebound of the abrasive from the mask. Dr. Hashish has illustrated this problem with a diagram. If the mask is not shaped properly, or if it has been used before and is worn, then it may have a chamfered edge. 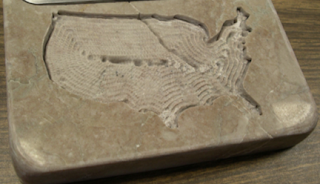 When the abrasive waterjet stream strikes the curved surface it can be reflected back onto the work piece, giving an unwanted erosion shadow along the edge of the pocket. Another problem can arise if the speed of the nozzle, and the distance that the nozzle moves between passes is not controlled to ensure a smooth and even cut over the pocket surface. As mentioned in an earlier post, the roughness of the cut increases if the abrasive particles are allowed to bounce and make a second cut within the piece. To ensure quality, as a result, the nozzle should be moved, relatively quickly, over the workpiece. Yet the inertia of the cutting head, and the drive assembly in the table motion controller make this difficult to do at relatively high speed. John Shepherd at PIW Corp came up with an answer to this problem, that coincidentally did away with masking. Figure 3. The Wobbler showing the nozzle motion. The concept behind the device is that, by slightly oribiting the motion of the focusing tube around an axis, the jet will sweep out a circular path on the workpiece. Because it is only the end of the focusing tube that is moving the forces involved are small, and easily provided through a small motor on the device. The relative speed with which the nozzle moves over the surface is now much higher, while the speed of the main arm remains relatively low. The device was studied at MS& T and the parameters that controlled the depth and quality of cut were found by Dr. Shijin Zhang as part of his doctoral research. As with the control of single passes of a non-oscillating nozzle, the distance between adjacent passes is critical to the satisfactory performance. If the distance is too great then ridges will be generated in the floor that are almost impossibly to remove using abrasive waterjets alone. Dr. Hashish, in an early paper on milling, for example, showed that if the upper layers of a pocket are aggressively milled with higher pressures and larger grit sizes, that this floor roughness cannot be later removed by using finer grit sizes. 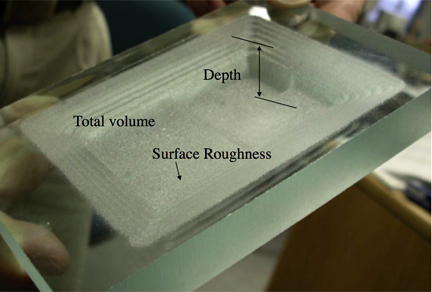 This is because the finer grit, while removing some surface asperities will still erode the surface relatively evenly, so that the roughness pattern shown in figure 4, cannot be later removed entirely. On the other hand it is not always necessary to have a high quality surface for the pocket. For example MS&T have made a number of plaques where metal plates, cut and lettered with the AWJ are then inset into pockets in polished samples of marble or granite. Since these are not strength-bearing, and the plates are glued in place, the pocket floor does not have to be of that high a quality. Figure 5. Milled pocket in the shape of the United States, Note the edge sharpness and the narrow cutting radii. On the other hand, where a smooth surface is required then this can be equally well achieved through programming the path of the overall head movement, so that the nozzle sweeps the floor evenly. 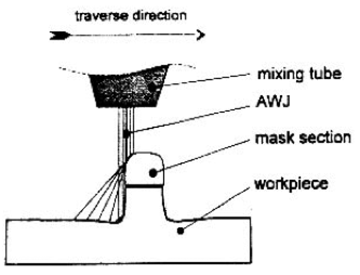 The glass plate in Figure 1 was also milled with the Wobbler. Figure 6. Pocket cut into metal without a mask, using the Wobbler. Note the smooth floor. I will come back to this topic next time.